To access these permissions, go into the Team Settings tab of the Showroom Settings. User can edit all product information besides Prices and upload and edit images. If unchecked, they will only be able to view product info. User can edit product prices and add markup or discount on presentations. User can invite/remove users from the showroom and make changes to Showroom Settings. By default, only the Showroom Owner's teammates are eligible to view all orders collected in the Showroom by all associated reps. 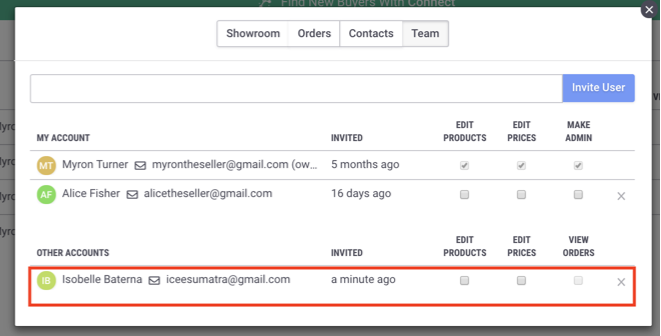 Checking this box for a user on a different team allows them to view and edit all orders, overriding the system default. Please speak to Support to enable.